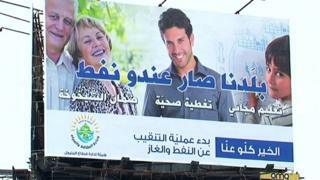 Two years ago, billboards across Lebanon declared: "Our country has oil." The announcement was supposed to bring with it the magical solution for many of Lebanon's ills, among them chronic public debt, power shortages and poor public services. Back then, the prospect of major oil discoveries off the Mediterranean coast triggered dreams of a prosperous future, but today it seems like the Lebanese were the victims of false advertising. Governments in Lebanon have a long history of mismanagement that seems to have extended to the country's oil and gas resources. At the beginning of the 21st Century, seismic scans conducted in the so-called "Levant Basin", in the eastern Mediterranean Sea, suggested the existence of significant oil and gas resources off the coasts of Lebanon, Cyprus and Israel. The three countries embarked on separate journeys to locate the wealth underneath the seafloor. They hoped not only to achieve energy self-sufficiency at home but also to become exporters. From the onset, Lebanon has been very careful not to give figures about the size of the prospective resources or the wealth they might generate. But caution here is more a sign of confidence than uncertainty. There seems to be a consensus among experts that Lebanon's resources ought to be considerable. Officials point to the impressive line-up of international oil and gas companies that showed interest in investing in projects in the part of the Levant Basin within Lebanon's territorial waters. But for almost two years now these companies have been unable to submit their bids and compete for the exploration of specific areas. They are still waiting for the Lebanese cabinet to approve two pieces of legislation even though the technical details having long been finalised. One concerns the division of Lebanon's Exclusive Economic Zone (EEZ) into blocs. The boundaries of two of the blocs are disputed by Israel, though Lebanon maintains they are well inside its waters. The second piece of legislation concerns the legal relationship between the state and the companies which won the bids to exploit the resources found within each of the blocs. The process has been so delayed that some companies have become lukewarm about the prospect of doing business with Lebanon. "One reason for this is the governance of the sector," says oil expert Ali Berro. "Another might have to do with the international crisis [in the price] of petroleum products. But given the long-term investment, some companies that have excess reserves might be still looking to invest." Despite widespread condemnation of the impasse within the cabinet, there does not seem to be a clear explanation for the delay. A source summed up the situation: "On the one hand, there is resistance from some political forces which are not used to having to make such big deals transparently and without any commission being siphoned into their pockets. "On the other is the long-term concern of some regional powers, which see Lebanon becoming a serious competitor once it starts producing oil and eventually offers it to European markets. These regional powers have their allies in the government." But as Lebanon remains bogged down by political squabbles, other countries it the region have not lost time in exploiting their resources. Israel has made the biggest advances so far. It has already started producing gas offshore from the Tamar field, while it has also made a major gas discovery in another field named the Leviathan. Cyprus has also concluded the second licensing round for companies. But officials in Lebanon still insist the country has a competitive edge over its neighbours. Lebanon is connected to the Arab Gas Pipeline, a 1,200km (745-mile) natural gas pipeline that runs from El-Arish in Egypt's Sinai Peninsula to Aqaba in Jordan, and ends next to the Syrian-Turkish border. Lebanon is connected through a pipeline that connects Tripoli, in the north, to the Syrian city of Homs. The Arab Gas Pipeline makes it potentially easy to deliver natural gas to Europe as it facilitates access via Turkey to Europe, where energy resources are scarce and countries are looking to reduce their dependence on Russia for gas. The devastating conflict in Syria, the outcome of which is far from clear, has cast doubts on Lebanon's ability to use the pipeline. However, Mr Berro sees cause for optimism. "Syria is the only land we have access through. It's the best option for Lebanon to develop its natural gas," he says. "But Lebanon is not likely to start producing oil before five to eight years. By then things may have changed. "This way we will be able to compete with other countries in the region because natural gas by pipelines costs much less than liquefying natural gas then re-gasifying it at import terminals." Cesar Abou Khalil, an adviser to the minister of energy, seems to agree. "The main competitive advantage that we would have is being able to export gas to Europe in a smooth and cheap way, while others have to build massive and costly structures that would force them to offer their products at a higher price," he says. That reasoning hinges on the current uncertainty being resolved. It will take a long time for production to begin, and at the moment, politicians in Lebanon do not seem to be in a rush.